The Life Center Church of God in Christ, 5500 S. Indiana Ave., was the place to be Saturday, July 18. The Chicago Housing Authority Alumni Association’s Ida B. Wells/Darrow Homes chapter hosted a free Gospel Celebration featuring the Grammy Award-winning gospel singer Albertina Walker, international gospel recording artist Kim Stratton, the CHA Law & Order Band, the New Life Performance Company and the Crumble Sisters. Pastor T.L. Barrett Jr., Sandra Hall, WMAQ-TV NBC 5 Station Relations Director Delores MeBain, Cecelia Peeler and CHA Alumni Association President Loisteen Woods-Walker co-chaired the event. The CHA Alumni Association was founded in 1984 by the late Bernadina C. Washington. The CHAAA is made up of former residents who give back to the community by awarding college scholarships to CHA youths. For seven or eight years following the death of Ms. Washington, the CHAAA had been dormant. But the growing needs of the residents of public housing sparked the revitalization of the CHAAA in 1995. According to MeBain, the event at Ida B. Wells was a public relations effort. “The purpose for this event is to draw attention to the Alumni Association,” said MeBain. The turnout was low but the people in attendance were having a glorious time. You could see and feel it. During the celebration, the co-chairpersons took turns speaking and introducing the guests. The first guests were was the Crumble Sisters, a gospel group consisting of a mother and three daughters. They sung “What if God is Unhappy with our Praise” a capella. The emotional expressions on their faces at the song’s crescendo really moved me. They were in perfect harmony and it sounded so smooth and clear that I began to meditate on the Lord. Next came the dancers of the New Life Performance Company. Two young ladies dressed in ballerina apparel danced elegantly to an instrumental praise and worship song. Not a sound was made during the dance. In between performances, people were invited to join the CHAAA and scholarship applications were given out. “It’s good that people don’t forget where they came from,” said Woods-Walker. Former Ida B. Wells resident MeBain talked about the old days when people used to be proud to live in the developments and how some tried to get in, like NBC 5 news anchorman Warner Saunders. Up next were the CHA Law & Order Band, made up of men and women from the CHA Police Department. They threw down on the song, “I Believe.” I was in the center front row and could see and hear every word very clearly, which made me move with praise and adoration. I tell you truly, with just a few in attendance, the whole concert was a sight to behold, especially when the one and only Albertina Walker started. She talked a little bit about how grateful she was to the CHAAA for having her and that she was glad just for the mere fact that the Lord had woke her up another day and blessed her over the years. She briefly said a few words about the low turn-out: “If the doctors and lawyers that have come from Cabrini alone would acknowledge that fact, this place would be filled.” The room exploded with excitement and approval. Walker then thanked the Lord for her voice and began to sing. When she sang, “Joy Cometh in the Morning,” I felt serene and at peace and began to cry. The words to that song describe the daily troubles that people go through and it moved me so much that I wanted to shout. Instead, I just rocked back and forth. She sang from the heart. The next time I’m not going to fight the feeling. Hallelujah! I tell you, that 68-year-old woman has been blessed with a strong and powerful voice. After Walker’s beautiful songs, the ceremony upstairs ended and everyone was invited to attend the brunch prepared for us downstairs. There was plenty of good food and drink and people began talking and taking pictures. Shortly thereafter, LeClaire Courts resident Kim Stratton and her son arrived. She set up everything she needed, thanked the CHAAA for their invitation and began singing. Stratton is a graceful Praise & Worship singer who is dramatic with her hands while singing. The sound of her voice as she was praising the Lord carried me away and for an instant and I felt as though our spirit was in tune with the Lord’s spirit. I began to silently praise and worship along with her. Oh I tell you, It was something else. Some people left and didn’t get to hear Stratton but I thank the Lord that I was able to attend because I needed the uplift at that particular time. I left encouraged and feeling good. Keep up the good work, CHAAA!!! At present, the CHAAA works out of four chapters: Ida B. Wells/Darrow Homes, Altgeld Gardens, Cabrini Green and Robert Taylor Homes. Last year, the CHAAA hosted an event at Navy Pier featuring Jackie Thompson and the Black Ensemble Theatre. That event raised $15,000, which supported five CHA youths. To find out how to apply for the scholarship and other information, call the CHAAA hotline at (312) 454-6176. Eight thousand adults involved in the new federal welfare program will participate in a new state program that will help people find and keep jobs. On Tuesday, Sept. 16, 1997, a press conference was held at the Illinois Department of Human Services, 2100 S. Michigan Ave., at which Gov. Jim Edgar announced a $32 million job preparation and training program. The state will target 12 inner city areas that are in the greatest need of job education, training and placement services. The governor said that it made good sense to see that people have the proper skills in order to perform well on the job. He added that people couldn’t be moved from welfare to work without these kinds of investments. The Illinois Job Advantage’s objective is to help what state officials call “difficult to help” welfare recipients get ready to work, get a job and stay on the job. $8.4 million of the $32 million will reach 8,000 adult Temporary Assistance to Needy Families (TANF) clients. According to TANF federal guidelines, it is required that states have at least 30 percent of TANF clients working or involved in work-related activities by October 1997. There are only 12 communities that will be the focus of this initiative: Ashland, Auburn Park, Cabrini-Green, Englewood, Kenwood, Michigan, Oakland, Park Manor, Pershing, Roseland, Western and Woodlawn. The Department of Human Services will select and administer the $8.4 million in grants to community agencies to provide job preparation and training. Also, the selected agencies will be responsible for many things including support services, mentoring and addiction services as well as connection to child care. The agencies will be paid on the basis of their success in placing clients into jobs. The community agencies will be selected and funded by the end of October and the remaining $24 million will be distributed statewide and to other Chicago neighborhoods by DHS. Because of the brutal attack that nine-year-old Cabrini-Green resident Girl X suffered, Chicago Public Schools officials decided to hold a march recently to raise money to help students and staff members that have been affected by violence. The Chicago Public Schools (CPS) Foundation held its first walkathon in Grant Park on Aug.16 to raise money for the Crisis Support Fund. The walkathon was basically a 2 ½ mile walk around the perimeter of Grant Park that began at 9 a.m. Because it was early Saturday, I didn’t expect as many people as there were. To my amazement, there were many participants representing many schools across the city. In fact, some participants were also there representing the Chicago Board of Education itself, with its many departments. Here are just a few of the many participants: Englewood Technical Preparatory Academy, Cockrell CPC, CVS High School, Kenwood Academy, Nettlehorst Elementary, Parkside Academy, the Montefiore Special School, The Arab American Council-Alnmhajireen Mosque & School, Parents As Teachers First, and the Park Eddy Foundation. That’s just a few! On route, the Percy L. Julian High School’s marching band greeted the walkers with some fabulous sounds. There were booths stationed within the park for many purposes. Some were serving the hungry walkers lunches. In other booths, the volunteers were handing out raffled T-shirts, caps, backpacks and tickets to certain restaurants. There was also a registration and a booth for a local TV station. After the walk, a rally was held. Two high school students and a second grader as well as other selected people read poems, talked about the coming school year and said how pleased they were with the outcome of the walk and what the walk meant to them. CPS Chief Paul Vallas was among the speakers and received a $5,000 check presented to him by Anil Shama, president of the Association of Indians in America, and his associates, who also invited the walkers to join them at their booth after the rally for some Indian food, music, free T-shirts and caps in celebration of their 50th Independence Day. After all the speeches and congratulations, Mary Nell of 950 AM, a hip hop/rap radio station, announced the entertainment of the day, the Chicago Cheerleaders, the Percy L. Julian High School Marching Band and others. The event ended at 12 p.m. The Crisis Support Fund is part of the Children First Fund. It was created after “Girl X” was brutally raped in January 1997. The Fund is designed to provide emergency financial support to Chicago Public Schools (CPS) students and staff who are victims of crime and violence in their time of need. For further information about the Crisis Support Fund or about the Children First Fund, call the “Children First Fund” hot line at: 773-535-8672. Let me first begin by saying that, as the mother of six children, I am concerned about them in every way, including their education. So I thought it would be a good idea to write about what is happening with Chicago’s Public School Reform. I attended the April 9 march on Springfield. There were many marchers as well as speakers, all trying to be heard. 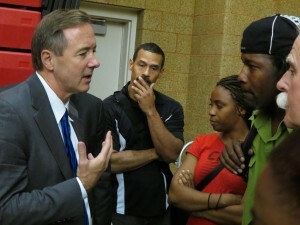 Among the speakers were James W. Compton, president/CEO of the Chicago Urban League.